People love Olana as much for the landscape as for the house and the treasures inside it. Be it a stroll around The Lake, or the stunning vistas from Ridge Road, or just the sound of the wind in the pines, the out of doors at Olana is spectacular! We get tens of thousands of visitors each year for these features alone, but in the winter, it’s practically a ghost town around here. Some winters one can walk the carriage roads and The Lake hardly freezes. However, the cold temperatures and a heavy blanket of snow this winter means one may need some help in getting out. People often ask about winter activities at Olana such as sledding, ice skating, snowshoeing, skiing, ice fishing, and even pond hockey. Staying fit and healthy is just as important in the winter as the other seasons, but it can be more difficult. 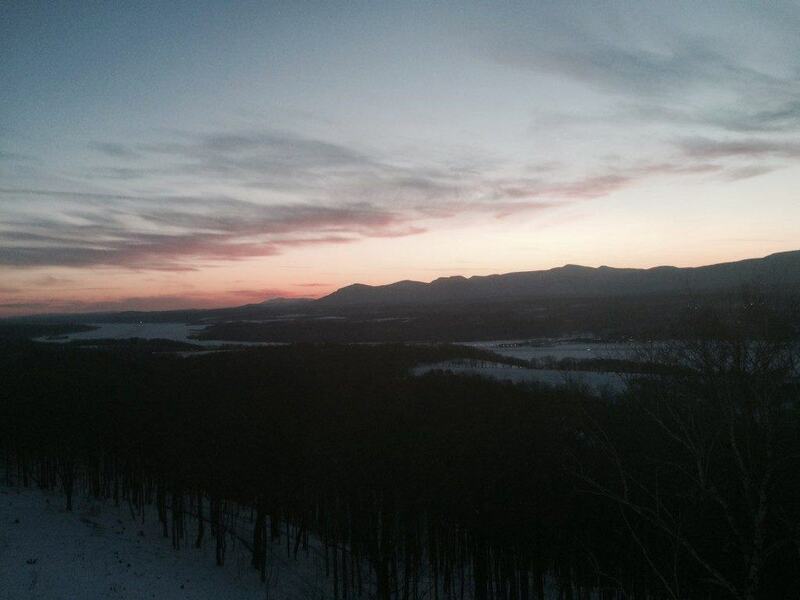 So here is the scoop on getting out and enjoying winter at Olana. 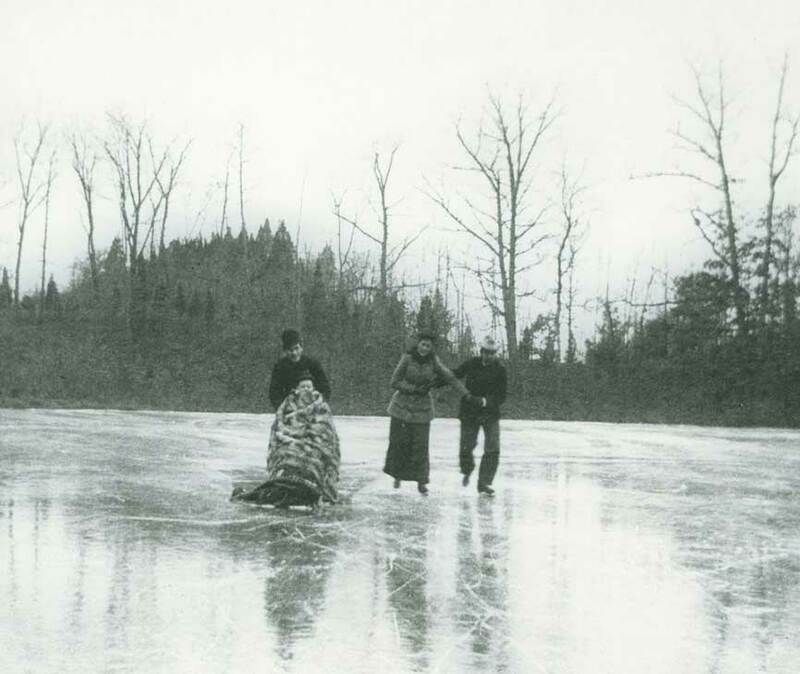 Unidentified photographer, Friends of the Church Children Skating on the Lake at Olana, Thanksgiving weekend 1892, photograph, OL.1985.922, Collection Olana State Historic Site. 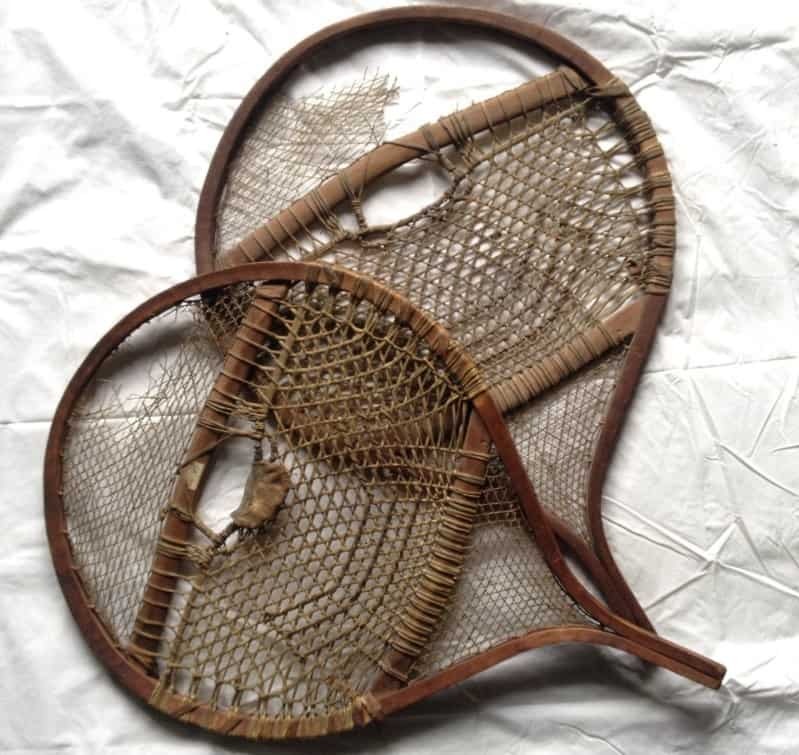 Pair of Snowshoes, circa late 19th century, wood, leather, rawhide and string, 21 5/8 (diameter) x 31 3/8 (length) in., OL.1982.1881.1&.2, Collection Olana State Historic Site. We have had a number of snowshoeing programs this winter, and the snow has been great for this. Snowshoeing is one of the best possible aerobic exercises since it is low impact on the joints yet burns calories similar to jogging. It’s also easy to do. Even a walk around Ridge Road, though it’s only a mile, is a great workout on snowshoes. The snowshoes in our collection look a bit dated compared to modern snowshoe technology, but they capture the idea that, even back then, snowshoeing was fun. Sledding was a modern tradition here for many years. Sadly, a serious accident ended sledding at Olana. Someday, we hope to bring back sledding. Until then, try Burger Hill in Rhinebeck for sledding. Skating on “The Lake,” as they called it, was another pastime the Church family enjoyed. Yet we ask that you, “please stay off the ice!” The Lake does at times freeze thick enough to allow one to go onto the ice. However, since The Lake is spring fed, the spring water is warm enough to prevent the ice from consistently freezing thick for very long. Skates, snowshoes, and even skis become death traps should one be wearing them if the ice collapses. A heavy blanket of snow on the ice makes it even worse. Snow has insulating qualities that allow the spring water to quickly melt the ice from underneath creating thin spots in the ice from the bottom up. These thin spots are often impossible to spot until it’s tragically too late. There are skis in our collection too. Olana is great for cross country skiers, and we encourage you to come make your own tracks here. Of course, we don’t have a lift (or a big mountain for that matter), so there is no alpine skiing. However, you can venture out into the meadows on cross country skis so as long as you keep in mind that what you go down, you later have to get back up. This year, Olana has had truly excellent snow quality for cross country. To make getting out even easier, there is now a free app with a map. The Olana map was create by the New York State Department of Parks, Recreation, and Historic Preservation (OPRHP). It has all the carriage roads and even shows mileage. The Olana map by clicking here. The app is PDF-Maps and is available at the same site. For everyone else, we have free maps of the landscape by clicking here. and a printed version is free in our Museum Shop (open 10:30-4 Friday-Sunday until May). Please remember, Olana is your park! The landscape is open 365 days a year from 8 a.m. to sunset (and the restrooms are open then too), so come see the views, get or stay fit, and experience the great outdoors in the picturesque landscape at Olana.